An unaltered photocopy of your Report of Separation (DD-214, WD AGO, etc.) If your service in the European Theater is not displayed on your Report of Separation you must provide a copy of your Report of Separation -AND- a copy(s) of any military-issued clearly displaying your European service. SHOULDER SLEEVE INSIGNIA. Description: On a dark blue Norman shield with curved top 3 5/16 inches (8.41 cm) in height and 2 1/2 inches (6.35 cm) in width, palewise, a double handed flaming sword, 2 1/8 inches (5.40 cm) in length, hilt golden yellow, white blade, red flames, all below an arched chief 5/8 inch (1.59 cm) in depth on center line, 1/8 inch (.32 cm) from the top and sides of the shield in sky blue, the base of which is 5/8 inch (1.59 cm) on center line divided into a rainbow of five colors: red, golden orange, yellow, green, and blue in descending order. 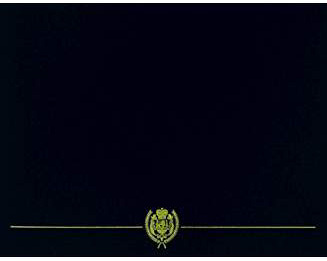 Symbolism: The black shield, changed to dark blue when redesignated for the Headquarters U.S. Forces, European Theater in 1945, represented the darkness of oppression. The sword of liberation with rising flames represents justice by which the enemy power will be broken. Above the sword is a rainbow, emblematic of hope, containing the colors of the National Flags of the Allies. The sky blue above the rainbow represents a state of peace and tranquility to be restored to the enslaved people by the United Nations. Background: The shoulder sleeve insignia was originally approved for the Supreme Headquarters, Allied Expeditionary Forces on 13 December 1944. It was redesignated for Headquarters, U.S. Forces, European Theater and revised to change the background color from black to dark blue on 2 August 1945. It was redesignated for the European Command on 23 June 1947. The insignia was redesignated for United States Army Europe on 7 November 1952. It was amended to include the specific shade of orange in the description on 22 July 1970. It was cancelled effective 16 July 2009. The insignia was reinstated for United States Army Europe on 7 July 2009, revoking the cancellation. (TIOH Dwg. No. A-1-367). DISTINCTIVE UNIT INSIGNIA. Description: A gold color metal and enamel device 1 3/16 inches (3.02 cm) in height consisting of a vertical sword point up, with gold hilt and a white blade issuing red flames to wither side above a gold background contained in base by a curved V-shaped blue scroll with ends at either side of the flame turned gold; and the scroll inscribed with the words SWORD OF FREEDOM in gold letters. Symbolism: The flaming sword, a symbol of military strength and readiness, and the colors gold, white, red, and blue are adapted from the shoulder sleeve insignia of United States Army Europe. Background: The distinctive unit insignia was originally approved for United States Army Europe on 27 July 1970. It was cancelled effective 16 July 2009. 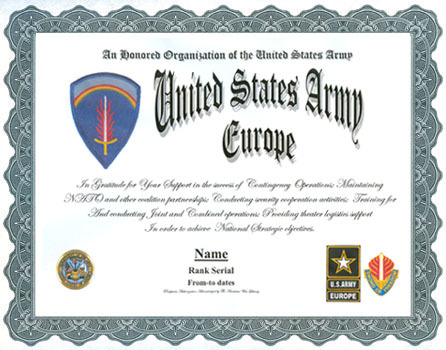 The insignia was reinstated for United States Army Europe on 7 July 2009, revoking the cancellation.